An integrated washing machine may just be just what you're looking for if you're need something unobtrusive to blend in with your existing kitchen design. I know because I’ve been there myself, so let’s take a look at what you can expect for your money in 2019. The first thing we need to consider is how to go about choosing from the huge range of options that are currently on the market. Do you go for the established brand name you trust when shopping for white goods? Or is it worth spending time to look into all the options? I’ve been there, trying to figure out what actually represents value by scanning through pages of specs and data sheets late into the night, so I’ve compiled a checklist for you to work through to make the process straightforward. What Is an Integrated Washing Machine? If you want to hide a washing machine from view, you can build it into a cupboard or other suitable storage unit. ​Integrated washing machines are a specially designed class of device that allow you to do exactly that without having to worry about adequate ventilation. ​They provide a good blend between aesthetics and performance. ​You no longer have to see a corner of your kitchen or laundry room dominated by a machine that doesn’t match your decor. Integrated washing machines are a specially designed class of device that allow you to do exactly that without having to worry about adequate ventilation. In my opinion, they provide a good blend between aesthetics and performance as you no longer have to see a corner of your kitchen or laundry room dominated by a machine that doesn’t match your decor. What’s The First Thing to Look for? I always recommend starting with the dimensions that you have to work with in your home. You may have a couple of places in mind where you can install your new machine. Get busy measuring them up so you know exactly where your new washer will go and that if it will fit! Once you know how much space you have, you’ll be able to see the dimensions of each washer and begin homing in on your perfect match. Every device you add to your home will consume electricity, there’s simply no getting away from that. When choosing the best integrated washer dryers, we examined the energy rating and electricity usage very closely . ​It’s something that I paid a lot of attention to quite recently as I wanted to make a purchase that would have a minimal impact on my monthly electricity bill. Ratings range from A - G, with A+++ being the highest. The latest built-in washing machines are considerably greener than years gone by. We've only selected washers for you that are rated A+ to help lower your carbon footprint and keep your electricity costs down. As well as the latest washers being more energy efficient, they're also a lot quieter. Providing your build your storage space correctly, noise shouldn't be an issue. Of course, if there are loose fixtures or unlevelled surfaces then this will cause enhanced vibrations that will likely cause annoyance, but this can be easily rectified. You can check how quiet a washer is by looking up the Noise Level in the specifications. The lower the number, the less noise, and as integrated washers are enclosed a portion of their noise should be damped down. Not everybody is a fan of integrated washing machines. Some people believe their smaller size means they're not durable and can't handle larger loads. This is simply not the case, and you can routinely find reliable machines that can last for years and handle loads up to 9 kg. Another perceived drawback is the price. As with any market, there is a range of prices distributed across models and manufacturers. On examing integrated vs non-integrated washers, there is little discernible difference in price across the range. You can probably buy a regular washer with comparable specs slightly cheaper, but many people think the improved aesthetics and smaller size are worth paying a premium for. Are They Worth the Extra Work? An integrated washing machine provides a simple way to put the aesthetic side of things first when it comes to your kitchen. The ability to close it off to the world keeps everything nice and orderly. It will also lower the noise during spin cycles and help keep your kitchen more hygienic. While you need to be a little more precise with the space requirements and finishing when taking a built-in route, I personally didn’t find this prohibitive or off-putting. After all, when you’re buying something you use all the time and want to last for years, an extra couple of hours work here isn’t the biggest commitment in the world. With the above in mind, let’s take a look at 5 of the best integrated washers in 2018. Bosch first started making washing machines in 1958, and 60 years later the brand is still pushing boundaries in the home appliance industry. This Bosch series 6 model has an 8 Kg load capacity, which makes it a great option for the family home. You'll have no problem taking care of all the kids clothes and large duvets, too. It has also been awarded the highest A+++ energy rating, meaning it was have as minimal impact as possible on the environment and your electricity bills. With width and depth both under 60 cm, this is a slim machine that gets lots of complements for it's good looks and build quality. What really stands out is how quiet it is. At just 41 db during the regular spin cycle, this is one of the quietest washers on the market. The biggest drawback for this model is its high price. You are certainly paying a premium for an established name. Something else to consider is the absence of any Quick Wash option. These settings are great to have available when you are in a hurry (and with a family when aren't you?!) or want to remove a single stubborn stain. Not having one on a machine that is priced at the very top of the market is disappointing in my opinion. If you're looking for a competitively-priced integrated washer from a brand you can trust, ​the Hotpoint BHWMD732 is a good choice. This 7KG capacity is perfect for a small family and the 30 minute quick wash is sure to come in handy when you need uniforms and PE kits fast. There is also a child lock to keep younger family members safe and stop them form changing the setting!. The stand-out feature of this model (other than the price) is how quiet it is. At just 64 db during high speed spin, and only 42 db during the wash, the Hotpoint BHWMD732 has practically the same output as the above Bosch model - at a fraction of the price! There are only 16 programs so things don't get too complicated. As well as having a high-temperature anti-allergen program there is a special setting for woollen items. And the ability to create your own custom program is a big plus. A few drawbacks to this machine is that it's only rated A++ and some might prefer a higher spin speed than 1300 rpm. The Bosch Series 6 uses 157 kw/h per year at an average cost of £24.18. This Hotpoint model uses 197 kw/h at an average cost of £30.34. As you can see, th​e Hotpoint is around 20% less efficient that the Bosch. However, the Hotpoint machine actually beats the Bosch in water left after spin - 53% vs 54%. So all things being equal, clothes will take shorter to dry and potentially save energy there. It's also available at a lower price point, so you need to weigh all this ​up when deciding which one is best for you. Beko is a Spanish manufacturer that's making serious inroads into the UK washing machine market. They have already picked up a couple of awards from “Which” magazine, and Curry's have previously named them “The Home Appliance Supplier of the Year”. This Beko model is in the same price range as the previously reviewed Hotpoint BHWMD732​ but there are a couple of key differences to take note of. The first is this model has a 16000 rpm spin speed, and this means only 44% percent of water is left after the wash. This is really impressive as many machines will have between 50% - 55% left over. Less water means your clothes will be able to dry faster, saving you a lot of time. If you're using a tumble dryer or radiators to dry clothes, it will also save energy and money, too. This model is rated A+++ for energy efficiency, and on average it uses 194 kwh and 9020 liters of water a year. This are pretty strong stats and big improvements over previous Beko models. One cause for concern is the noise is the noise during high-spin. On paper, the 72db is pretty mid-range, but users have complained watching a movie difficult in their open-plan floor accommodation. There is still much to like about this model. The 14-minute quick wash is one of the fastest on the market, with a lot of models only having 30-minutes (if at all). A half-load sensor is also a really nifty feature which will help for those mid-week loads that can't wait until the weekend. This feature automatically senses the reduced load and makes adjustments to improve wash quality and energy usage. Overall, this is a solid 7kg integrated washer which may be perfect if you dry a lot of clothes indoors. With an 8Kg load capacity, the Hoover HBWM814DC is ideally sized for a family-of-four. Aside from the generous drum size, there are a few more features that make this Hoover design stand out. The first is the number of quick wash programs available. Many comparable models will just have one 30 minute program, but the Hoover HBWM814DC has three! You can choose from either 14, 30, or 44 minute washes. For regular washes, there is a weight sensing “KG Mode” which allows the machine to make automatic adjustments for the time, water and energy required. If you have an infant at home, you'll know just how much extra laundry you need to do. There's nothing worse than the little one either spitting up or spilling something and finding your out of onesies. That's why it's great there is a “Baby Setting”, so you can do smaller cotton loads quickly and not worry you're wasting energy. And when it comes to energy efficiency, this model is superb. It has a A+++ rating and its 1400 rpm spin speed only leaves 44% of water behind after washing. The real drawback to this model is how loud it is. At 82 db during the spin-cycle, it's in the top 10% of over 200 washing machines we analysed. And sadly, the regular was cycle puts out 62 db, where many comparable washers are in the 50 db range. However, if your kitchen or utility room in pretty enclosed, the extra noise might be worth the trade-off for the low price. The 9KG Candy CBWM914D is mid-priced and perfect for larger families whose laundry often piles up until the weekend. This Candy model has 3 quick wash programs which allow you to wash smaller loads in a hurry. With the quickest setting being just 14 minutes, it's ideal for washing baby clothes or shirts in a pinch. ​Another really great feature is being able to adjust the spin-speed and the temperature settings depending on the types of clothes you're washing. Speaking of babies, there is a dedicated baby cycle which is designed to get stubborn stains and not leave behind powder residue which can irritate delicate skin. There is also an automatic weight sensor which adjusts water and temperature settings to help save energy and improve washing quality. With an energy rating of A+++ it is a highly cost-effective choice over the long term that will make a minimal impact on your monthly outgoings. The only slight downside is there aren't a great range of pre-set programs. Whilst there is a baby cycle, there isn't a sports program or a high-temperature Anti-Allergen program either. 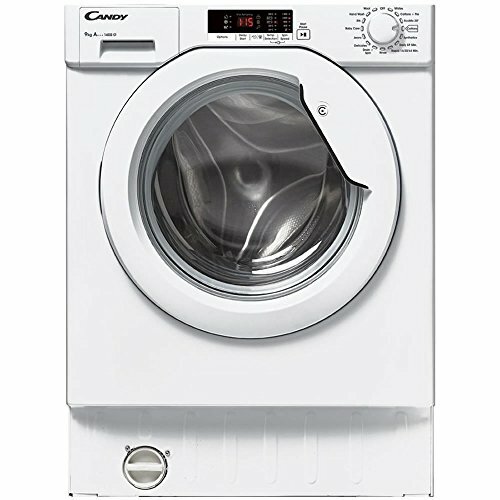 After carefully considering the pros and cons of the best integrated washing machines on the market today, we recommend the Candy CBWM914D. It's 9KG size makes it perfect for families. Even if you don't have a large family now, a good washing machine like this one should last for more than ten years so can grow with you. It also makes washing bedding and duvets a whole lot easier, too. We also love the mid-range price, the A +++ energy rating, the great selection of programs and having not one but three quick wash features.